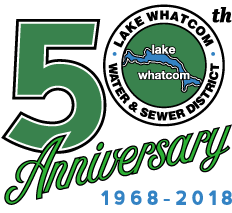 Bellingham, Washington (January 14, 2019) – Current and former commissioners of the Lake Whatcom Water and Sewer District gathered Friday evening with District staff to celebrate the District’s 50th Anniversary of service to the Lake Whatcom community and to recognize a number of District staff members that reached service milestones over the past year. Jason Dahlstrom, Maintenance Lead. Since joining the District as an entry-level maintenance worker, Jason has consistently demonstrated leadership skills and a work ethic that rightfully enabled his promotion to the position of maintenance lead. Under his current position, Jason is instrumental in ensuring that the District proactively maintains our water and sewer infrastructure, and responsively addresses emergency situations as they arise. Debi Denton, Finance Manager/Treasurer. In her ten years managing the District’s finances, Debi has brought a skillset to the position that enabled development and adoption of financial policies that have positioned the District to weather the storm of any unforeseen economic downturn or major system failure. Debi has also managed the District’s finances in a manner that has resulted in no findings during routine audits conducted by the State Auditor’s Office during her tenure. Norma Rowland, Accounts Payable/Payroll Technician. As a part of the District’s finance and administration team, Norma is responsible for processing all District payroll and accounts payable. Norma’s diligence and dedication to her job has and continues to play a significant role the District’s clean audit history throughout her tenure. Kevin Cook, Water Treatment Plant Operator. Kevin spent the initial decade of his career with the District as a maintenance worker, and has served as the District’s water treatment plant operator for the past ten years. In his role as operator of the District’s two water treatment plants, Kevin takes on a great deal of responsibility in ensuring continuous supply of clean drinking water to our customers, and in the significant reporting requirements to state agencies. Miguel Gillis, Utility Systems Support Specialist. Miguel knows where every one of the District’s over 4,000 water meters is located, as well as where most of the water and sewer lines are buried. His work ethic is unparalleled and his commitment to serving each and every District customer to the best of his ability is a trait that many strive to match. Miguel has deservedly earned the respect of the board, staff, and customers in his over 25 years of service. Mike Moritz, Maintenance Worker II. With thirty years of District service, Mike has been around for an astounding 60 percent of the District’s existence. With this tenure, Mike’s institutional knowledge of the District’s infrastructure will be greatly missed when he retires later this year. Mike is a valued employee, one that is always willing to take on any task that is assigned to him, and that completes each task diligently and efficiently.